In an economy that has continued to slow and affect nearly every facet of industry, the 27th Annual Pittsburgh Vintage Grand Prix (PVGP) held strong. The PVGP is unique in many ways - it is an all-volunteer event that is still run on city streets. It has been consecutively run for the past 27 years and attracts nearly a quarter-million spectators. The course has 22 turns, 3 of them are nearly 180 degrees, and top speeds exceeding 100 mph. Obstacles such as ancient stone walls, side walks, street signs, telephone pools, steep infield drop-offs, changing surface materials, and bridges are constant reminders to the drivers that any mistake could be very costly. The winners of the race do not earn points nor is there prize money. Yet, even without these motivations, most navigate the course to the extreme, pushing every corner and demanding the most out of their car. Granted, there are drivers that enjoy the race for other reasons, but most are out there to win, improve their lap times, beat the next car, and push themselves and their vehicle to the limit on a very demanding road course. Along with racing, the event serves to encourage and inspire the acquisition and preservation of vintage sports cars. The first cars on the course were the Pre-World War II category, which included classic sports and racing cars of the era that ran in the early years at legendary venues like LeMans, Brooklands, Monza, and Nurburgring. America's pre-war racing heritage is represented by Indy, Sprint, and ARCA cars. Included in this group was a 1912 Mercedes GP Car, a Duesenberg Boat-tail Indy Speedster, two Bugatti Type 37 cars, a Riley Brooklands, and several other prestigious and noteworthy legends. The Group 2 cars were the Under One Litre & Preservation vehicles that included those built after World War II, like Turner and Abarth. Included in this group were Formula 3 cars as well as H-Modified, which were both competitive classes in 1960s SCCA racing. Though very small and often noisy, their lightweight construction and low center of gravity made them very nimble and ideal for the challenging twists and turns of the Schenley circuit. Sports Racers and Formula Cars were the third group to take to the course. These were specially-prepared racing machines based upon production sports cars, and had been modified to participate as dedicated racers. Formula Juniors are small, open-wheel race cars built largely from production car parts. Lotus, Elva, and Jabro are among the prominent marques in this class. The Lotus 7 was easily the most popular entrant in this group, with nearly a dozen examples circling the course. The next group was the medium-displacement cars from 1944 to 1959. Marques such as Alfa Romeo, Triumph, Aston Martin, Austin Healey, and Elva were well represented in this group. Group 5 were the over two-liter (pre-1960) cars featuring many European models such as Jaguar, Austin-Healey and Porsche. Group 6 cars were the Small Bore Through 1965, Modified, and H-Production vehicles. This group includes cars from early to mid-60s era. The final race group was the BMW Marque Exhibition Race. With several BMW 3.0 CS/CSL models and a slew of legendary 2002 cars, this group was one of the fastest of the day. The Pittsburgh Vintage Grand Prix selects a specific automobile model to honor during their Race Week in July. This chosen car is called a 'marque' and often appears on the Grand Prix's poster, billboards, t-shirts and race program - becoming the brand of the event for the entire year. The Grand Prix has selected and honored an annual marque since its third year in 1985. To honor this year's celebrated marque, BMW, several important, special, historic, and vintage machinery were put on display throughout the 10-day event. Along with the old, several unique modern cars that are rarely seen were also shown. At both of the BeaveRun Race and the PVGP, a special class was reserved for the BMW cars. When BMW was last honored at the Pittsburgh Vintage Grand Prix back in 1998, the Marque tent showcased a fabulous display of the company's motorsports history and contained a collection of rare race and show cars which included the BMW/McLaren, less than three weeks from its win at LeMans. A decade later, the marque tent and grounds were a tribute to BMW. Memorable cars such as the pre-War 328 and the post-War 3.0 CS and M1 attracted a steady flow of spectators. The owners and fans of BMW were in force throughout the 10-days, celebrating the car's heritage and racing lineage. The event is as much apart of the drivers as it is the volunteers. Many faithful volunteers have been working for the PVGP for multiple decades. Many of the corner workers have worked for several decades but have only seen the practice, qualifying, and the race from their special vantage point. On a course that offers 2.33 miles of gorgeous scenery, their dedication to their 'spot' is even more appreciated. Many have made their corners 'Their Corners' by adding decorations such as windmills and pink flamingos. It may appear 'tacky' but there is often a story and a reason behind the mementos. Anyone who has ever tried to organize an event understands the monumental duties that are involved. Since the PVGP is run entirely by volunteers, this undertaking is even more epic. The 10 day event is orchestrated and organized by those giving up their time and energy. Just analyzing the work needed to pull-off the Grand Prix is mind-boggling. Permits, contracts, sponsorship, promotional material, corner workers, tow truck operators, timing/scoring officials, pit/paddock directors, food preparation, logistics, and the countless other tasks are but a few of the duties that make this event happen. Then there are the parades through city streets, car shows throughout the city, and dinners. To complicate things further, there is a second separate race at another location. With over 1,200 dedicated volunteers working to entertain the 250,000 people who cram into Schenley Park for Race Weekend, it is evident that the Volunteers are an elite group of workers and among the finest in the country. 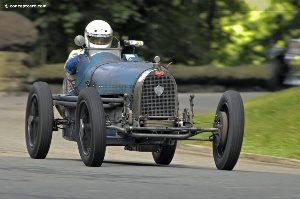 The PVGP is the largest volunteer-based event in vintage racing. In 2008 the volunteers consumed 3 tons of ice, 300 cases of soft drinks, and 600 cases of water. Schenley Park is the scene of our nation's only vintage race held on city streets. This 456 acre golf course and park hosts over 2,000 show cars and well over 200,000 spectators for the weekend - and admission is free. It is usually worthwhile to mention the weather when it does not cooperate as expected and when rain interferes with plans. For the PVGP, rain has been a common visitor throughout the years and tends to show up to one event, if not more. This year, the weather cooperated and the rain stayed away. The BeaverRun Historics had great weather; the car shows had great weather; and the PVGP had great weather. So the big new was there was no rain (aside from a few sprinkles which did not interfere). With seven groups and over 175 vintage cars racing around Schenley Park, the weekend was very full, exciting, enjoyable, and entertaining. The car shows that graced the lawn of Schenley Park and the hundreds of thousands of spectators that partook in the PVGP celebration proved that even in a 'down' economy, expectations can continually be surpassed. Over the past 26 years, the PVGP has raised $2.4 million for local charities. 2007 marked the fourth straight year that the PVGP set a record with a $171,000 donation to the Autism Society of Pittsburgh and Allegheny Valley School.